Once you’ve entered a meeting room as a moderator or host, you are able to share your screen by clicking on either of the two highlighted buttons shown below. 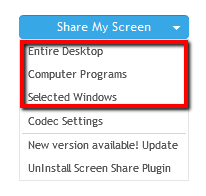 If you don’t have the Screen Sharing plugin installed, a download option will show up. 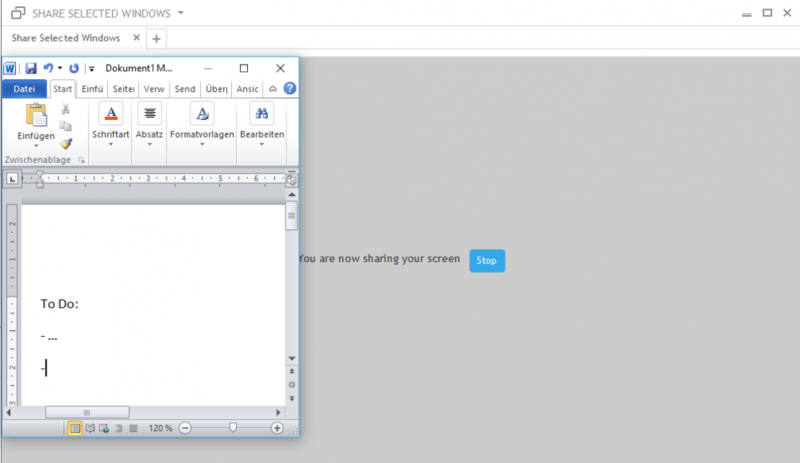 You must install the Screen Sharing plugin to be able to share your screen with other participants in the meeting. The “Computer Programs” option allows you select a specific program and share its ui with everyone else. The “Selected Windows” option will allow you to select only one window from the ones you have already opened in your computer, so you can share only that window with the rest of attendees. (For example: you have a Word document open, your browser window and a notepad window active at the moment. You click on the “Selected Windows” option and then select the Word document window in order to start sharing it. The only thing that the rest of participants will be able to see during that time on the meeting will be your Word document window. All the other applications that were not selected will show up in black).